An Exhausting Day At The Gym..
Had my 3rd session of Muay Thai training at the Elorde Gym in Mandaluyong last Tuesday and I would say I am already getting the hang of it somehow. Well, I’m getting used to the pain, I’ll say! Or so I thought! As usual, I went there right after my shift – I arrived around 7AM. For the last 2 sessions, my trainer Loy was already awake and having his cup of coffee by the stairs. But that time, Kuya Bong said he was still asleep! So I told him to just let Loy sleep a little bit more since it was still early and I’d just run a few laps and do some jump ropes. After a few moments, I saw him coming out from his dungeon (Hehehe.. As if he’s a dragon? ), looking tired and too sleepy and as if he was just dragging himself to wake up. I pretended not to see him since I don’t like messing up with people who just woke up. Yah know, here in the Philippines, we have a saying – “Magbiro ka na sa lasing, wag lang sa bagong gising!” (Throw a joke to a drunk person but never to a person who just woke up!). Anyway, I thought he’ll be a little bit lenient with me that day since he wasn’t feeling okay but it seemed I was too wrong! He knew what he was doing and intensified my routines which made me really exhausted and really want to take a rest and sleep. But me – being a fighter and all – doesn’t want to show defeat, and tried my best not to faint. Bwahahaha! (I don’t like others see me weak!). I felt okay all throughout the session though I drank 3 ½ litres of water for a two-hour workout. Hehehe. And never had a bathroom break! I guess, all of my excess fluid came out as sweat! Anyway, still enjoyed the session and the people there at Elorde Gym are easy to get along with. I had conversations with the other trainers after my session and had a few laughs here and there while my trainer Loy was having his catnap somewhere (I didn’t bother to chat with him after since he looks so tired. Poor boy! Bwahaha!). Before I left, I had a short chat with him when I saw him already up and torturing another poor guy. He even had the guts to tease me that I’ll experience the same thing the guy was doing then! Hahaha. I just laughed it off though I was looking intently at the poor guy’s condition as he was sweating profusely – obvious small lakes of sweat on the floor. Aaaaahhh! Panic mode! Anyway, if you see him, he may look like an innocent young guy who just decided to have a tattoo out of peer pressure, but beware – he can definitely break your bones! Hahaha! Unless you’re a homosexual and will try to harass him, he’ll definitely run away immediately! Things I Can’t Let Go.. They say that in this life, you should learn to let go in order to move forward. Let go but never forget. 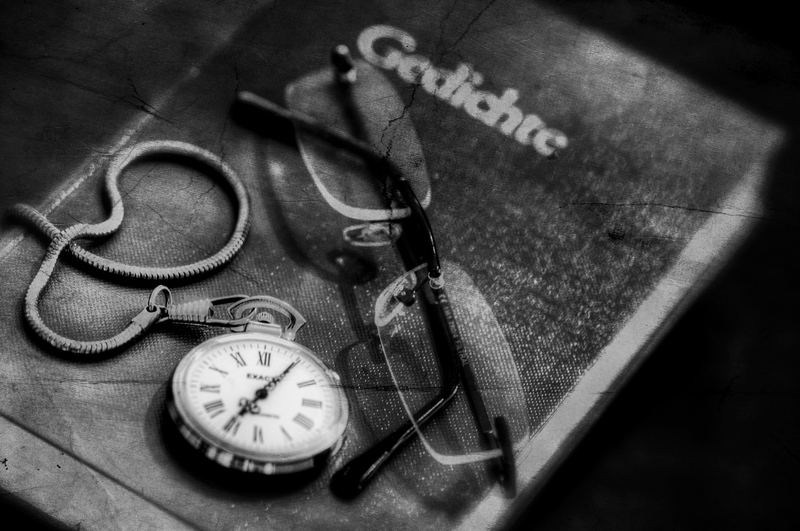 There are even people who were assisted by professionals to stop them from hoarding and let go of those things they keep that have sentimental values. They were told that they should just keep the memories in their hearts and let go of those material things. But I can also say that there are things I can never let go. In this age of technology — text messages, emails and video calls, are ways for us to communicate to our friends and loved ones. It makes our lives easier but it also prevents us from creating wonderful and tangible memories to keep. We no longer send snail mails full of warmth but instead, we send emails. E-Cards, in place of cards with handwritten dedication. I am happy that today’s generation is living in a fast-paced society but also sad that they would no longer be able to experience how it feels to have cramps while writing a very long letter for your friend or run to the nearest post office as soon as it opens for you to send your letter. As I was rummaging my stuff, I found my old box of letters I keep when I was in high school (ok, that’s more or less 15 years ago). It still has the letters my friends gave me during my birthdays or just whenever they wanted to. 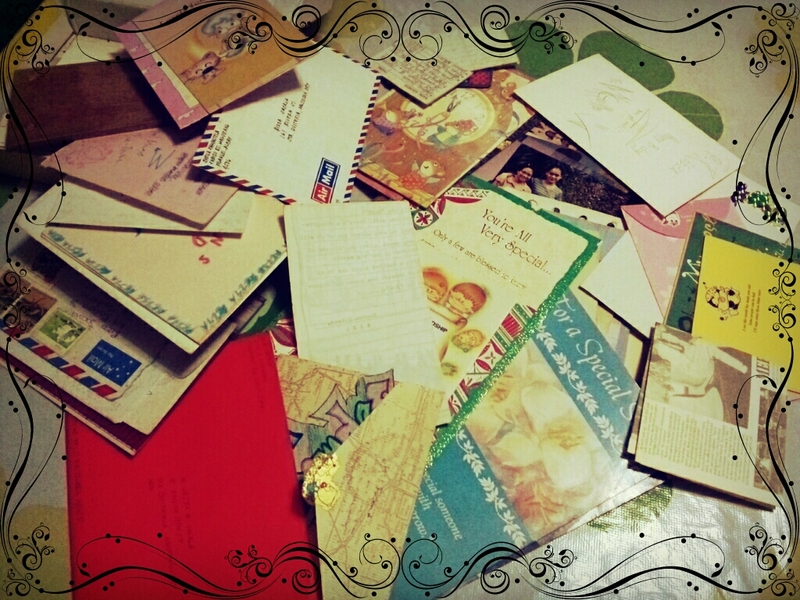 The cards my eldest sister sent me when she had to stay with our grandparents in CDO to study. 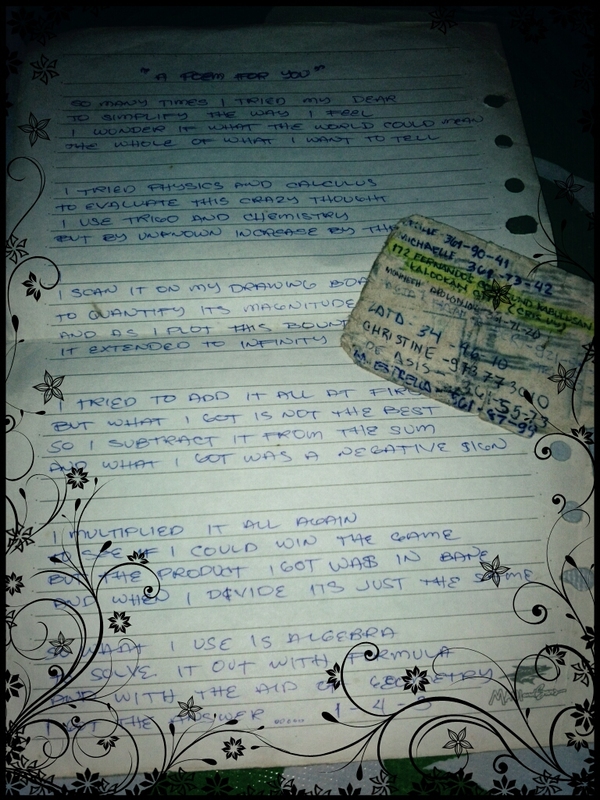 I even kept in there a small piece of card where my first love wrote his old address and a poem I took from his notes. Hehehe. It brought back all the memories. I didn’t even know that one of my suitors (yeah, you heard it, I had a few back then) in College wrote a letter for me telling me he was letting me go when I turned him down. Nyahaha!! It was so nostalgic when I started reading them again. Some of them are funny since they were written during high school, grammar errors were abundant — subject-verb agreement, singular vs. plural and tenses. But they still bring the same emotions, like excitement and anticipation as you open the envelope. I am thankful I decided to keep them because if I didn’t, I won’t have this opportunity to reminisce about the old days and on how they feel about me then. Well, almost all of them I still have communication with while others, I don’t have any more news about. It’s not bad to keep souvenirs or like me, old letters, and treasure them. Though as they say, you can keep the memories inside, it also adds up having to see physical proof of their care and love for you. How they have spent even just 5 minutes of their time to write that letter for me. Letters show the feelings and emotions a person doesn’t wanna show on his/her face. Haist! I’ll be 31 in exactly a month from now! Though I don’t mind getting older every year (it’s part of life you know, you can’t escape from it), but still, there are things I hope won’t pass by so quickly.. People or feelings I wish would just stay forever.. But just like age, the other thing constant is change..
Hmmm.. Any plans before the big day? Nope..
Just like the previous years, nothing planned in particular.. It’s just another day for me aside from the additional greetings and teasing for beer and party.. Nope.. I won’t budge even if you push harder peeps! Bwahaha! 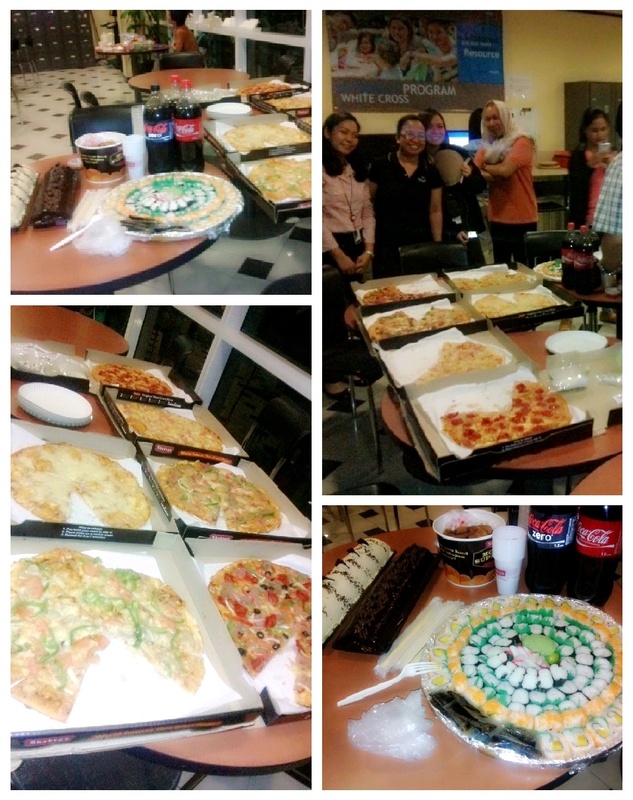 Raissa, my co-worker and friend, and I, always have a small pizza party for our teams during our birthdays.. She celebrates her birthday a week prior to mine, so we usually hold our pizza party in between.. Last year, we had a Japanese-Italian themed gathering — several boxes of pizza and mojos, cakes together with sushis and makis..
Now, we still don’t have plans on what we would bring for our birthdays but we will surely have to do something.. It has been a tradition at the office though it’s one of those pocket-wrecking moment.. Nyahaha..